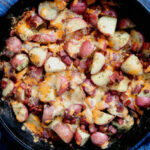 A recipe for oven-baked cheesy bacon ranch potatoes. No dressing, no packet required. What’s not to love about crispy bits of fried bacon and roasted red potatoes seasoned with tangy dill and smothered in a mix of melty Cheddar and Smoke Gouda cheese? I’ve wanted to present this dish at the family table for quite some time now, however, I happen to live with a couple of family members who just don’t dig on the whole ranch dressing thing. Namely, my husband and children. They don’t ranch under any circumstances. Like, ever. Woe is me. 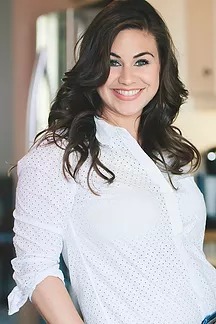 When I really started digging into the world of recipes for cheesy ranch potatoes, I started to see a little light for myself at the end of the tunnel. You see, many of the recipes out there, called for drenching a mass of potatoes with ranch dressing, and then baking them. Now if you have a family of ranch-despisers like I do, I’ve found that it’s not necessarily the seasoning that people don’t like, it’s the seasoning in combination with the milk, sour cream or buttermilk. The dressing itself could easily be nixed (along with the calories it adds to the dish), and dry seasoning would actually prove to be a better choice for getting those potatoes to crisp up nicely. Ranch seasoning itself, is extremely easy to make at home, and lucky for us, doesn’t require an extra trip to the store to retrieve the ever-forgotten ranch packet. The only “outside the box” (or rather spice cabinet) ingredients you may need to splurge on are dried dill and chives. I think you’ll find it very likely you have the rest of the spices just sitting there, ready to season up some cheesy bacon ranch potatoes. 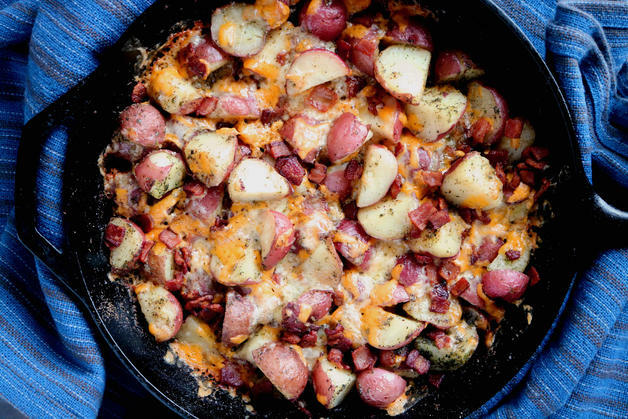 In this recipe, the potatoes are parboiled to ensure a creamy center, then tossed in a little leftover bacon grease from our crispy, homemade bacon bits. Afterwards, the potatoes are hit up with our easy, homemade ranch seasoning, and topped off with crumbles of bacon and freshly grated cheese. Once the masterpiece comes to together, it’s transferred to the oven and baked, just until the cheese is melty and the skins of the potatoes have crisped up. This recipe was a complete success for the whole family, ranch lovers and ranch haters alike. Cheesy bacon ranch potatoes are the perfect combination of both flavors and textures. This recipe makes for more than one’s fair share of potatoes. Use it as the dinnertime side dish that just keeps on giving (well…at least for one more night or so), or the ideal side dish to any barbecue and enjoy. Preheat the oven to 375°. Add potatoes to a large pot and cover with water by 1 inch. Transfer to the stove top and bring to a boil over high heat. Allow the potatoes to boil for 15-20 minutes, or until tender enough to pierce with a fork. Drain potatoes and set aside to cool. While the potatoes are cooling, cook the bacon. In a cast iron skillet, or a large, oven-safe pan, over medium-high heat, add the diced bacon and saute for 7-8 minutes, or until crispy. Remove from the heat. Remove bacon, and set aside on a plate lined with a paper towel. Spoon out the majority of the grease, leaving behind only a thin layer to coat the bottom of the pan (about 3 tablespoons). Once the potatoes are cool enough to handle, cut into larger potatoes into quarters and smaller potatoes into halves, so that they are roughly of uniform size. Transfer the potatoes to the pan, sprinkle with dill, chives, garlic powder, salt, pepper and onion powder, and toss to evenly combine, and coat with the leftover bacon grease. In a bowl, combine the Cheddar and Smoked Gouda cheese. Fold about 2/3's of the cheese mixture, along with 2/3's of the bacon into the potatoes. Sprinkle the remaining cheese over the top, and sprinkle with leftover bacon and green onions. Transfer to the oven and bake for 20 minutes, or until the cheese is bubbly. Serve and enjoy.